This was originally a guest blog and was developed especially for the excellent Siren Magazine. After trying and failing and trying and failing at making my own pastry the way it should be, I finally gave in and bought a pack of ready made frozen pastry from the supermarket. I honestly don’t know why I didn’t just do this in the first place – it’s cheap, you still get all the fun of rolling it out and that home made look. Naturally, it is also the perfect consistency. Not too short, not too dough-y. Perfect! Having cracked the pastry problem, the world of tartlets was suddenly my oyster so I set about making what, to me, was the perfect Saturday lunch. 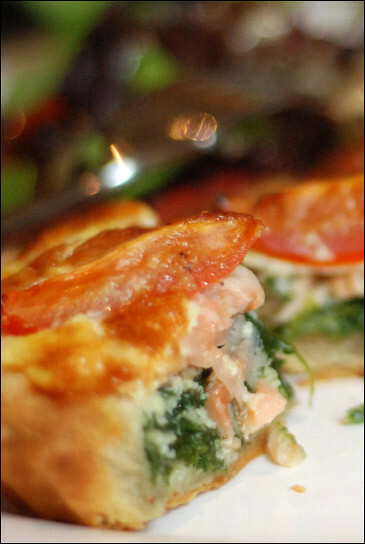 Smoked salmon, spinach, and a creamy but not-too-rich sauce. These are delicious hot or cold so make a nice additional treat to take on picnics or in packed lunches. Begin by rolling out the pastry on a lightly floured surface (to prevent it from sticking) so there is enough to line the pastry tins - it should be around 1.5-2mm thick. Turn the oven on to 190°C, then once you have lined the tins, remove excess pastry from the edges and then prick the pastry with a fork. Place a large square of baking paper (enough to fully cover the inside of the case) over the pastry and fill the cases with ceramic beans (though rice, lentils or dried beans will serve equally well). Place in the oven for 15-20 minutes. While the cases are baking, in a blender whisk together the eggs, crème fraîche, comté, nutmeg, salt and pepper and then set aside. Next, wilt the spinach in a pan with a hint of olive oil and the garlic clove crushed in for flavour. Once the spinach has wilted, transfer to a sieve to drain off any excess liquid. You might need to press the spinach firmly with a spoon – if the spinach is too wet, it will make the bottom of your pastry cases soggy. Slice the smoked salmon into ribbons, finely slice the spring onion and quarter the baby plum tomatoes. The pastry cases should be done by this point, so remove from the oven (but leave the oven on – you’ll be using it again very soon) and allow to cool for 10 minutes before you embark on the next step. Once the pastry is cool, remove the ceramic beans and baking paper and divide the spinach between the four cases so that it lines the bottom of the case. Then, add the smoked salmon and sprinkle the spring onions on top. Arrange four quarters of tomato on top of each tartlet then finally, spoon the egg mixture into the tartlets until it just reaches the top. Place the tartlets back in the oven for a further 15-20 minutes, until the egg is set and the surface of the tartlets lightly golden. Let cool for 5 minutes then serve with a fresh green salad. Bon appetit! What a strange happenstance. I saw a link to Siren mag on Twitter and went for a nosey and there you were!